KRYMSKE, Ukraine -- Few places along the front line in east Ukraine see regular fighting as bitter as the village of Krymske. In this photo taken Tuesday, June 23, 2015, a Ukrainian serviceman from the Kiev-2 volunteer battalion fires an weapon at a frontline in the village of Krymske, east Ukraine. Few places along the front line in east Ukraine see regular fighting as bitter as the village of Krymske. For now, Krymske is in the hands of Ukrainian government forces and the volunteer battalions that fight alongside them. Roads to the village have all but crumbled away under the weight of military trucks, tanks and armored personnel carriers. For now, Krymske is in the hands of Ukrainian government forces and the volunteer battalions that fight alongside them. Somewhere in the distance is the enemy: Russian-backed separatists whose stated aim is to double the amount of territory under their control. The whole front line is mined. Unseen tripwires litter the fields. Wandering unguardedly into the foliage risks attracting heavy machine-gun fire. The sound of ammunition blasts is heard throughout the night. 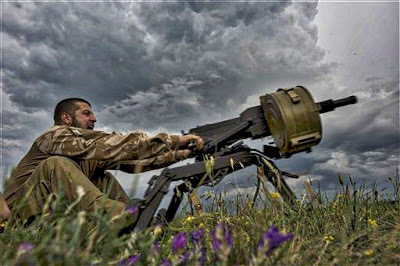 Everybody uses everything that they have: mortars, rocket launchers and heavy machine guns. These battles usually last no more than two hours, but usually less. Around an hour before light breaks, a new volley of rocket fire flies in from rebel positions. The artillery fire keeps going until 5 a.m., the shells sailing over Krymske and landing with a burst somewhere in the distance.